If you're looking for a fence with a modern style that offers superior protection, the Secur model is a solution. Made to resist the onslaught of motivated trespassers, the panel's sturdiness comes from two horizontal and one vertical heavy-gauge wire welded at each intersection. This system is recommended for projects requiring greater security and safety, those in high-risk areas and overly abused locations. The unobstructive, see-through panel allows monitoring of activity beyond the fence. A 45-degree overhang can be added for more protection. Applications include amusement parks, water-treatment plants, schools and airports. Create perimeter security and crowd-traffic control by using Wausau Tile's site furnishings, which simultaneously enhance your landscaping. A wide variety of colors, textures and sizes are available, as well as custom designs to match your specifications. The planters and bollards produced by Wausau Tile's Site Furnishings Division are reinforced with steel rebar, encased in 5,000-pound PSI concrete. With proper installation and strategic placement of these bollards and planters, you will have created a substantial crash rating. The patented Stopper II (STI-1100) has been helping stop false fire alarms worldwide for more than 25 years, without restricting legitimate alarms. This protective cover offers excellent protection against physical damage (accidental and intentional), dust and grime (using a gasket kit). It consists of a clear, tamperproof, super-tough polycarbonate shield and frame that fits over manual pull stations. When lifted to gain access to the actual alarm, it sounds a piercing warning horn. Immediate attention is drawn to the area, and any prankster will either run or be caught. Effective for public buildings, they are UL/cUL-Listed and ADA-compliant. 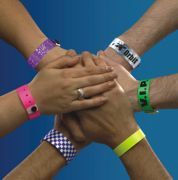 Choose Visa Band® wristbands for superior selection, value, quality and service. As ID wristband leaders since 1956, Precision Dynamics puts its experience to work for you. With one of the widest arrays of colorful, non-transferable Tyvek, vinyl and plastic wristbands, Precision helps you select the right wristbands to suit your specific needs. Custom-print with your message or logo, or choose from fun pre-printed designs. Use them for admission, group ID, special access, age ID, swimming ability, sponsorship, fund-raising and more. 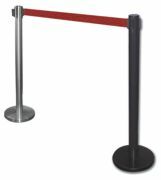 Whether you're rolling out the red carpet or keeping an unruly crowd in line, stanchions are a key element in crowd control. With the right products in place and a well thought-out plan, crowd control can be simple. Estimating traffic flow of people, plus strategic setup of stanchions can make all the difference. Highland Products can help, providing stanchions that are used across the nation at parks, schools, government facilities, entertainment venues and more. Highland Products offers a wide selection made from the most popular modern materials available, in colors and styles to match your facility at a great price. Gamewell, a manufacturer of commercial fire-alarm control panels and emergency life safety systems, now offers a state-of-the-art voice (audio) evacuation system product line. Gamewell's fully digital and networkable audio evacuation systems can support up to six channels of digital audio, including line paging and two-way telephone communications, plus various control functions, all operating simultaneously on a single pair of wires or fiber optic cables. The system provides prerecorded messages and emergency paging to facilitate orderly evacuation during a life safety emergency. It also can be used to alert building occupants of imminent severe weather and can be custom-configured. Do you have constant queues? TensaBeamsTM are an effective solution for managing large crowds. TensaBeamsTM combine the use of beams, panels and belts in a single system. They are sturdy, constructed from aluminum, flexible, available in portable and fixed systems, and increase safety. Beams come in both curved and straight systems and can be powder-coated to match existing decor. You can add infill panels for additional visual impact and control and purchase in-queue merchandising accessories such as hooks, baskets and shelves to turn your line into a profit center. Keep crowds back and enhance security using CrowdStopper® long-lasting barricades. 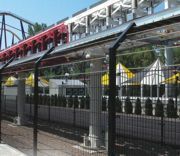 Signature Fencing's CrowdStopper® barricades are effective for a variety of crowd-control applications. Each maintenance-free barricade is manufactured using heavy-duty steel framing and is hot-dipped galvanized for long life and weather-resistance. Barricades ship fully assembled and are available in two different foot styles. They are used by police departments, event organizers, fairs, festivals, stadiums, arenas, convention centers and many others for effective security and control.